Not only the occasion of Guy Tunmer's single World Championship appearance, the 1975 South African GP provided the last showcase for the hosting country's local heroes, of which many took part in its sixties and early-seventies editions. Love and Charlton were also the only ones of a South African generation including Serrurier, Tingle, De Klerk, Van Rooyen, Pretorius, Keizan and Tunmer to have competed abroad for regular F1 teams before the Scheckter brothers put a resolute end to South Africa's splendid isolation. John Love might even have won a World Championship GP if not for a late refuelling stop for his self-entered Cooper in the Kyalami race on January 2, 1967. Thus the astonished home crowd missed what would have been a spectacular victory. A few years on, Charlton would do considerably worse in his two outings for Team Lotus, racing a 72D he was later to campaign in cooperation with Aldo Scribante, not only at home but also in several European GPs. By then, with the growing professionalism among the F1 regulars, the South Africans were nowhere in their second-hand material, merely making up the numbers. The couleur locale was certainly there in the sixties as well, but back in those days some of the odd South African machinery was capable of upsetting the establishment. From its first edition in 1962 until the 1968 GP the African continent's single World Championship event featured South African specials in the Derrington-Francis mould. There was the Alfa Special of Peter de Klerk and of course we had racer/constructor Doug Serrurier's LDS cars taking the ZAGP grid five years running. The LDSes were derived from Coopers before Serrurier started rebuilding Brabham chassis. 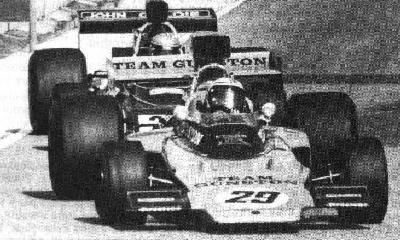 The Brabham-based LDS for Rhodesian Sam Tingle brought on the first international appearance of Team Gunston, which went on to form the core of the domestic F1 scene together with Aldo Scribante, Otelle Nucci, Alex Blignaut and Team Lawson. Joining Tingle in the Gunston line-up was team founder John Love, who saw Peter de Klerk and Jackie Pretorius come by as team mates in consecutive years and was to drive for the team until his retirement in 1972, this after being soundly thrashed by Charlton's newly-acquired 72D. Ironically, Gunston went the 72 route itself but only then when the design was thoroughly outdated. For 1974, it bought an E-spec 72 to replace the Formula A Chevron in which Ian Scheckter had unsuccessfully tried to prevent Dave Charlton from taking back-to-back South African championships. The elder Scheckter made his debut with the car in the 1974 GP, the same car taken over by Eddie Keizan, who had been running Blignaut's Tyrrell for the past couple of seasons. Keizan's team mate in a second 72E was to be Guy Tunmer. Essentially an amateur racer, Tunmer had spent his early career in saloons before moving up to the Springbok series in 1973, winning the Luanda 6 Hours in a 2-litre Lola. Concurrently he ran an ex-Peterson March 712 F2 machine in the B class of the local F1 series. For 1974, he stepped up to the domestic F Atlantic championship after acquiring a Chevron. Guy utterly dominated the season, taking 9 poles and 9 wins from 9 starts! This of course attracted the attention of top-line team Gunston, which took Tunmer on to partner Keizan in its two-car 72E team contesting the last South African championship to be run to F1 regulations. As part of a tradition about to be buried, Team Gunston also entered the South African GP, for which the more experienced Keizan qualified in 22nd, with Tunmer lining up 25th. Also part of the South African contingent were Ian Scheckter, who had taken over Keizan's Tyrrell and Charlton, who again was ahead of the domestic competition with the M23 he had acquired during 1974. 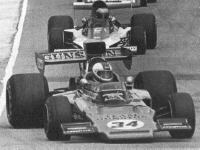 In the race, Guy Tunmer acquitted himself well, passing both Keizan and works Lotus driver Ickx, eventually finishing 11th, just behind Ronnie Peterson in the other works 72E. This of course highlighted the shortcomings of the ageing 72 but splitting the works cars was quite a performance nonetheless. So when the F1 circus reached Barcelona the South African was offered a Brabham BT44B ride by Bernie Ecclestone, who was suddenly short on drivers, all the GPDA members having announced general strike because of the alleged poor safety standards at Montjuich Park. As Tunmer was not a member of the GPDA he accepted the drive greedily. The overjoyed South African rushed back to his hotel to get his helmet and overalls but by the time he returned to the paddock the strike was over! For poor Guy this meant the 1975 South African GP would remain his only World Championship F1 race. On July 5 that same year Tunmer provided himself with small consolation by winning an F1 race all the same, taking the False Bay 100 at Killarney, round of the South African championship. It was probably the 72's last victory as well. The following season Tunmer took out his front-running Atlantic Chevron B43 again which was now eligible for top honours. Initially he ran well but during the year his focus gradually shifted toward running his own business of training and development for motor industry clients. Guy retired soon after.